Home and Gardening With Liz: Valentine's Dining With You My Friends! What a festive table. If my poinsettias were alive, I'd do exactly the same and I adore your placemats! Happy Valentine's Day! I’m so surprised at how well mine are doing. They add a bit of brightness to the day! Now that is a table to combat the winter blues. Great job! That red is banging! Ha ha! Yes the red is a wonderful punch of color at this time of year! Oh Liz, you know how much I like black and white, and the red adds such punch! 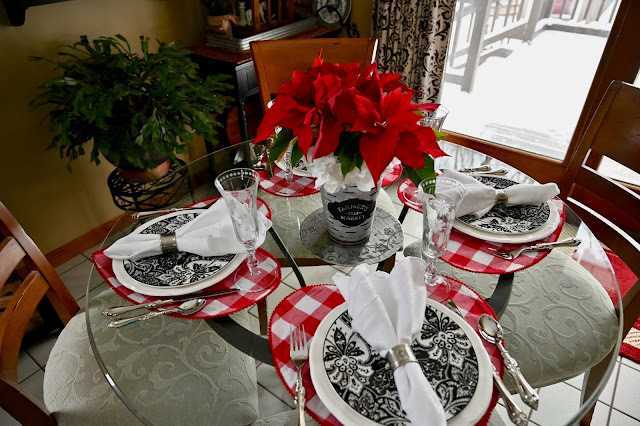 I'm crushing on those checked heart-shaped placemats --- such a great find! 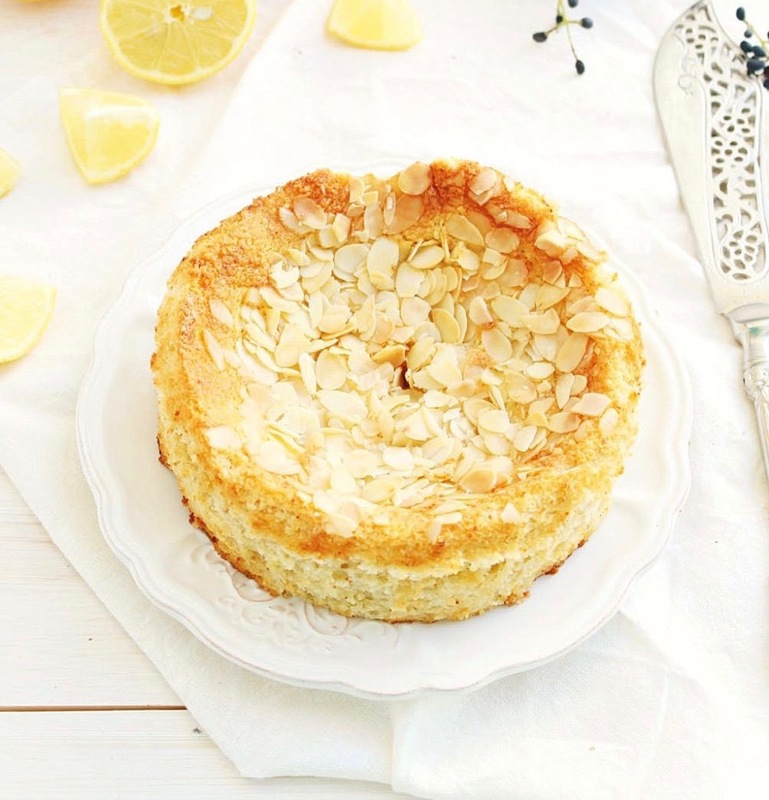 And don't they work so nicely on a round table too. Very cute table Liz. 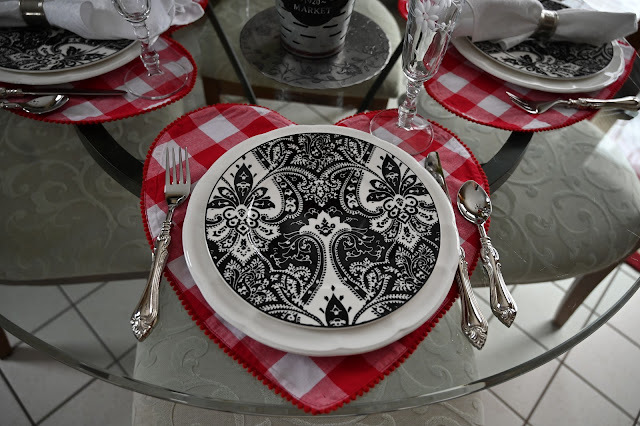 Love the heart shaped placemats. 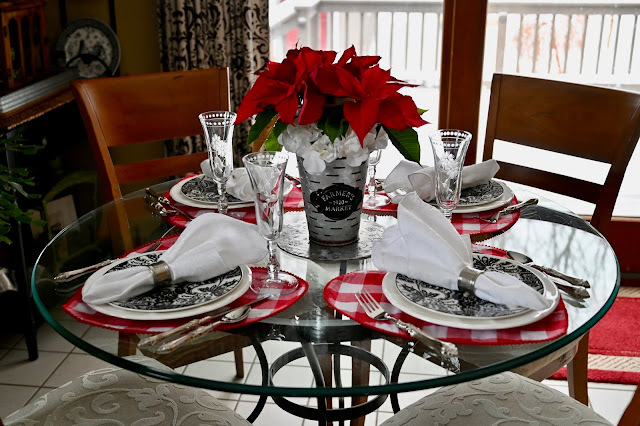 A cheerful table to chase away the cold dreary days. 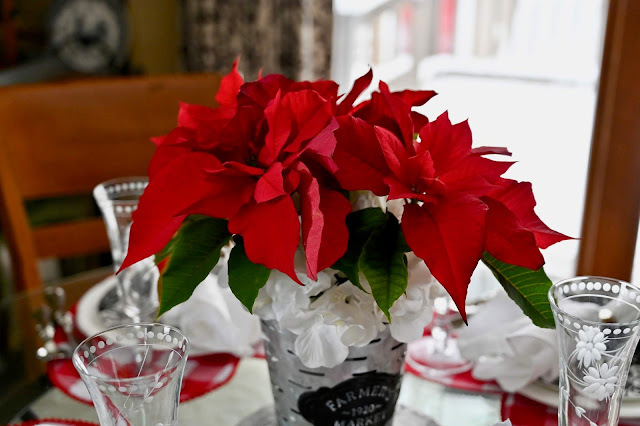 The poinsettia looks lovely on the table. I love lemon, so I am in. Beautifully done. We here in the midwest are really in the throws of winter. 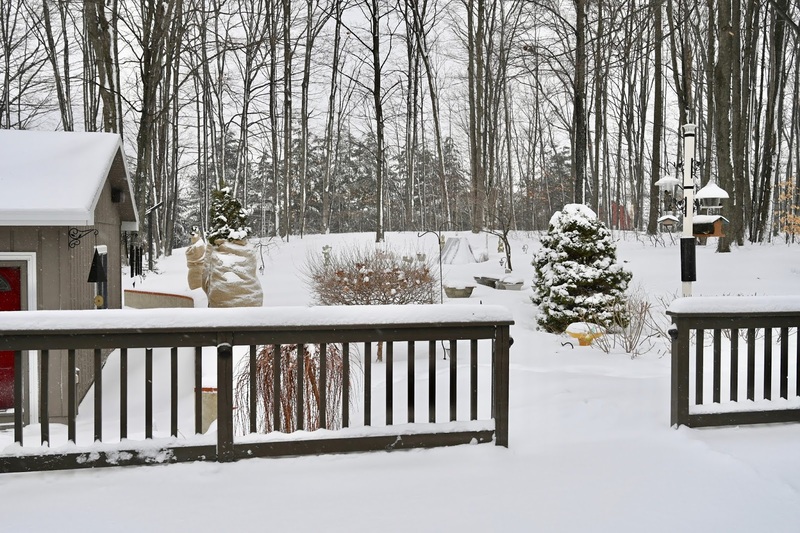 We are not getting as much snow but the cold is here. Tomorrow 40 and then it is dropping again and more snow towards the end of the week. Crazy. 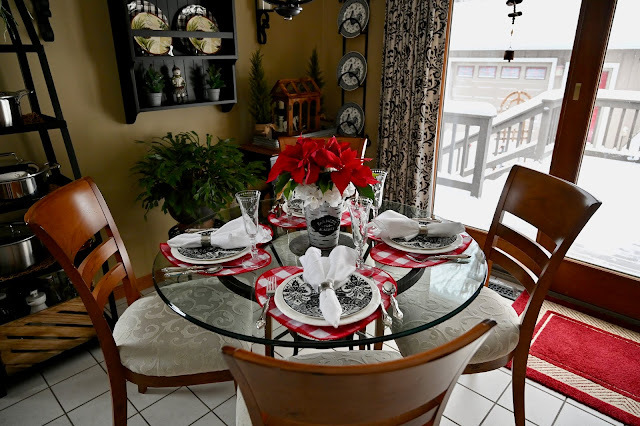 I love your Valentines table and glad you and your hubby will have a nice dinner in. Maybe a sweet candle lit dinner in front of the fire place. Classic Red, White & black! 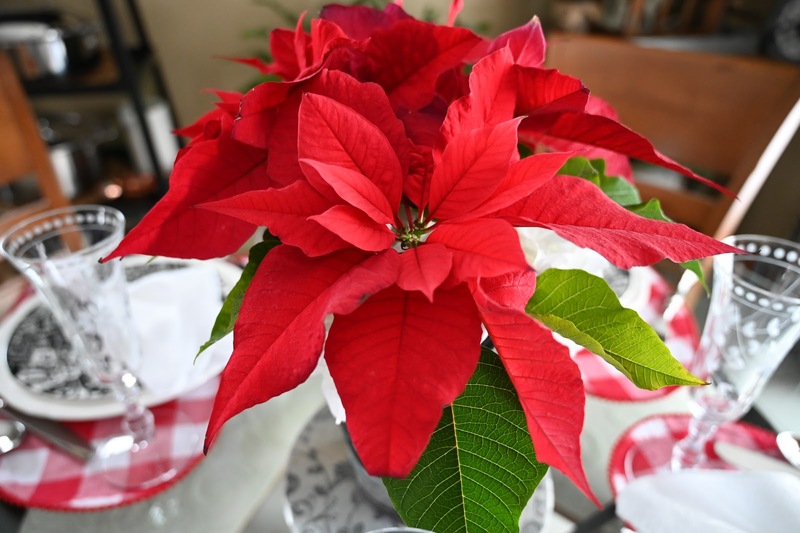 I love that your poinsettia is still going strong! 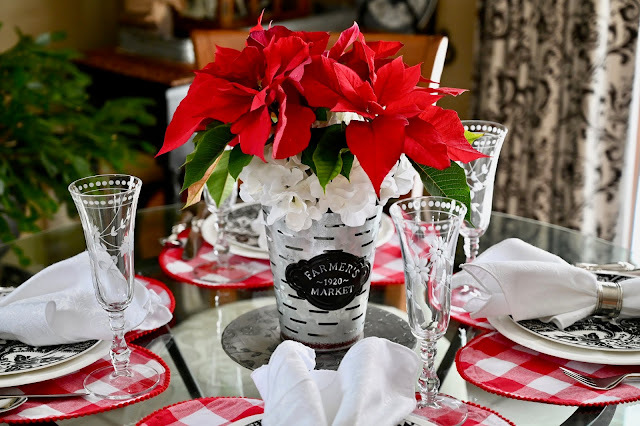 Hi Liz, your poinsettia works great on your table. It is still such a brilliant shade of red. My friend potted one a year ago on Christmas and it grew over the year and bloomed again this year. Also your table looks beautiful, the red checked heart placemats are sweet on the table. 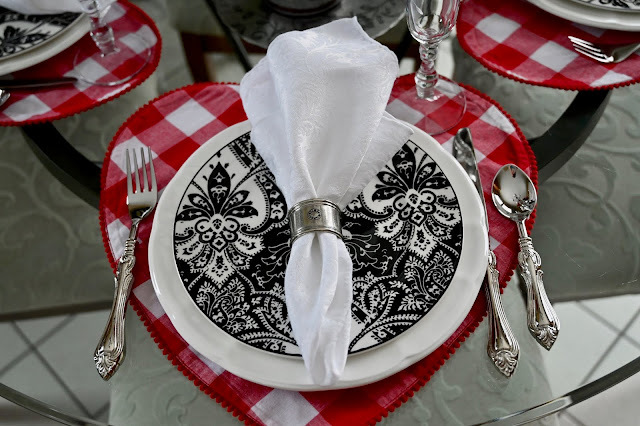 Nice combination with the placemats then white and black plates. Happy Valentine's Day. Liz!!!!!!! This is gorgeous!!!!!!!! Even under snowy, grey, gross conditions...so uplifting!! !